Well, Zynga's earlier claim to the "battle of the universe" is yet to be seen, but the prophesied Pirates Vs. Ninjas update to Treasure Isle is now live... and it's another map titled "Ninja Vs. Pirates." There better be some intense duels on at least one of this new map's eight islands or we will all be very sad ninjas--or do I mean pirates? You'll find a novice ninja monkey either sitting on your home island or inside your backpack who will need to be trained in the ways of ninja combat before he can take you to the Ninja Vs. Pirates map. You'll have to ask five friends to help train your simian shinobi or unlock each of the five training steps for 5 Island Cash, or about $1. Oh, this is just like the Wounded Dragon and Wounded Tiger maps before it, but with less pathetic creatures and more swords. After that's through, the new islands are yours to explore, though it's still unknown who's going to come out on top in this battle. It seems we'll just have to do some exploring to find out. 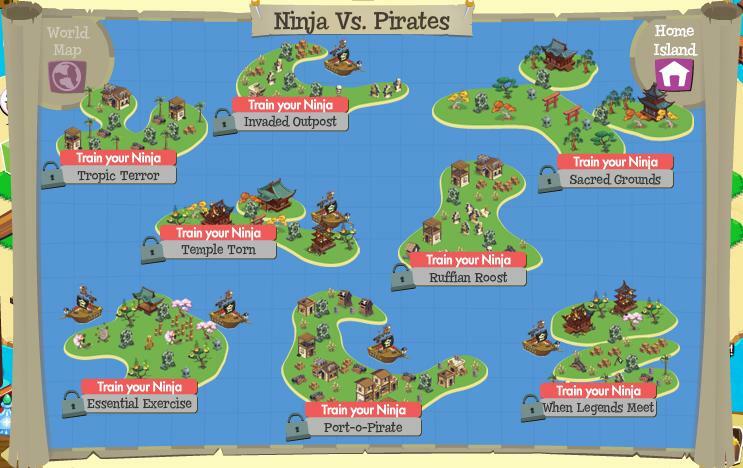 Have you tried the new Pirates Vs. Ninjas map yet? Have you come across any pirates looking to exchange blows? Let us know in the comments. Add Comment.